This article is about the section of Interstate 94 in North Dakota. For the entire route, see Interstate 94. Interstate 94 (I-94) runs east–west through the central portion of the US state of North Dakota. Eastbound, the route enters from Montana at Beach and passes Dickinson, Bismarck, and Jamestown before entering Fargo, where it exits the state at the Red River and continues into Minnesota, southeast to Minneapolis. The route passes to the south of Theodore Roosevelt National Park's southern unit; access to the northern unit is by US Highway 85 (US 85) north from Belfield. Eastbound, I-94 changes time zones at the Stark–Morton county line southwest of Hebron. Mountain time (UTC−7) is observed in Stark County (and west) and Central time (UTC−6) in the rest of the state. I-94 has two lanes in each direction through most of the state, expanding briefly to three lanes in each direction in the Bismarck–Mandan area (from exit 155 to 156) and in Fargo from 45th Street (exit 348) to the Red River. The route enters at Beach and passes through the Badlands near Medora near and the south unit of Theodore Roosevelt National Park. A public rest area about seven miles (11 km) east of Medora provides an awe-inspiring view, especially at sunset, and an opportunity to hike through some of the scenery on the Painted Canyon Trail. Further east, I-94 provides access to the north unit of the national park, then passes through the cities of Dickinson, Mandan/Bismarck, Jamestown, and Valley City on the way to West Fargo and Fargo, where it leaves the state and crosses into Minnesota. Through North Dakota, I-94 travels nearly due east-west, generally following both the railroad route and the former route of US 10 (called "The Old Red Trail" or "The National Parks Trail"), where its eastern terminus is at exit 343 in West Fargo. The highway intersects with the Enchanted Highway 11 miles (18 km) east of Dickinson at exit 72. At New Salem, it passes Salem Sue, a 38-foot-high (12 m) sculpture of a Holstein cow that is clearly visible on the south side of the highway; the road to Sue allows a vantage point to view a panoramic landscape. Between Mandan and Bismarck, I-94 crosses the Missouri River with a view of the Northern Pacific (now BNSF) Railroad Bridge to the south. At Steele, it passes the world's largest sculpture of a Sandhill crane, 40 feet (12 m) tall and named "Sandy", on the south side of I-94, just east of exit 200. At Jamestown, it passes the world's largest sculpture of a buffalo (actually bison) named "Dakota Thunder," 28 feet (8.5 m) in height and on the north of the highway. At approximately mile marker 275 on the westbound lanes between Jamestown and Valley City, the highway crosses the Laurentian Continental Divide, at an elevation of 1,490 feet (454 m) above sea level. The rivers that are west of this divide flow south into the Atlantic Ocean from the Gulf of Mexico, while the rivers that are east of the divide flow north into Hudson Bay. The James River, that flows through Jamestown, feeds into the Atlantic Ocean, while the Sheyenne River, that flows through Valley City (36 miles (58 km) east of Jamestown), feeds into Hudson Bay. In Fargo, a well-known yet unnamed pedestrian bridge crosses over I-94; opened 43 years ago in 1976, in time for the United States' bicentennial. While providing a unique crossing for the surrounding neighborhoods, it serves as a landmark for commuters and travelers. Westbound, it is one of the first North Dakota landmarks visible from the highway. Through the state, I-94 follows the route once taken by US 10 west from Fargo. This route was originally called "The Old Red Trail". Prairie Public Television in North Dakota produced a documentary about US Highway 10 and the building of I-94 through the state. I-94 roughly follows the route of the former Northern Pacific Railway mainline (now a BNSF Railway route) across North Dakota. Many of the towns and cities that I-94 serves first grew as railroad towns in the 19th and early 20th centuries. The first section of I-94 completed with Interstate funds (under the Federal Aid Highway Act of 1956) was a 12-mile (19 km) section between Jamestown and Valley City, North Dakota in 1958. ^ a b "Route and Mileage Map Insets" (PDF). North Dakota Department of Transportation. 2016. Retrieved January 8, 2018. ^ Kerzman, Kris. "Throwback Thursday: A brief history of the Interstate 94 walking bridge". INFORUM. The Forum of Fargo-Moorhead. Retrieved July 14, 2016. ^ Galadriel Findlay Watson (2001). North Dakota. Weigl Publishers. p. 5. ISBN 1-930954-53-0. ^ "Appendix III-09 B: Interchange Numbering on I-94" (PDF). North Dakota Department of Transportation. January 3, 2006. Archived from the original (PDF) on April 17, 2009. Retrieved June 22, 2008. ^ Google (September 3, 2013). "Former Rest Area" (Map). Google Maps. Google. Retrieved September 3, 2013. 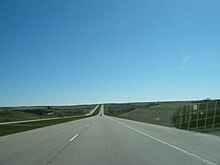 Wikimedia Commons has media related to Interstate 94 in North Dakota. This page was last edited on 24 April 2019, at 01:50 (UTC).